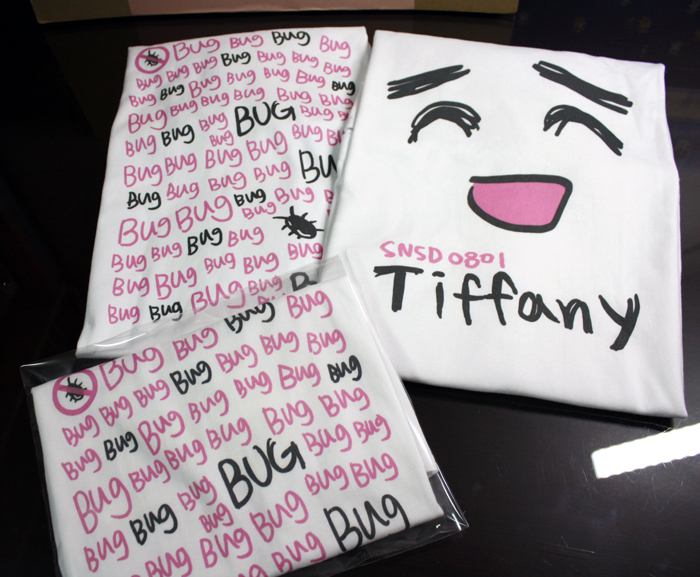 [Update #1 100711]: Singaporean SONEs can order the T-shirt here. Everyone that’s reading this knows who Tiffany Hwang is right?! The girl with the super stunning eye smile but at same time is terrified of bugs from SNSD? Well! A K-S♥NE known as “유규” has turned these two adorable facts into T-Shirt designs and an i-S♥NE known as chelupa@Twitter/Soshified will be taking orders for USA/Gobal residents! *Note: You may also order the T-shirts from 유규 here. Orders will only be taken within the USA. T-shirts will be shipped from SoCal(USA). However, if you are from outside the USA and would like a T-shirt as well, you may contact chelupa @Soshified/Twitter for discussions. You will receive an email from chelupa after submitting the order form. finally something from the u.s… but im not a huge fan of fany nor do i own a credit card… 😡 i wish there was a store in new york!